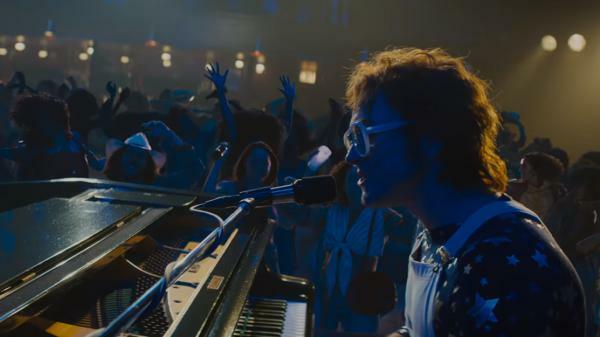 A still from the Rocketman movie trailer. Taron Egerton stars as Elton John in a movie directed by Dexter Fletcher, who, yes, also took over the reigns for Bohemian Rhapsody (the Queen biopic) once Bryan Singer left. Rocketman — developed by the rocket man himself — has gone through a number of directors (Michael Gracey) and lead actors (Justin Timberlake and Tom Hardy) since it was announced in 2012, but Egerton looks pretty smashing in big glasses and glittery outfits. Oh, and that's him singing, too. (You may know his voice as Johnny the singing gorilla in the 2016 animated film Sing). Due out summer 2019, Rocketman also features Bryce Dallas Howard as John's mother, Jamie Bell as John's collaborator Bernie Taupin and Richard Madden as John Reid, Elton John's onetime lover and longtime manager.